Isn't Italian food the best? It's got so much going for it: noodles, cheese, sauces, basil, goes well with wine...the list continues. 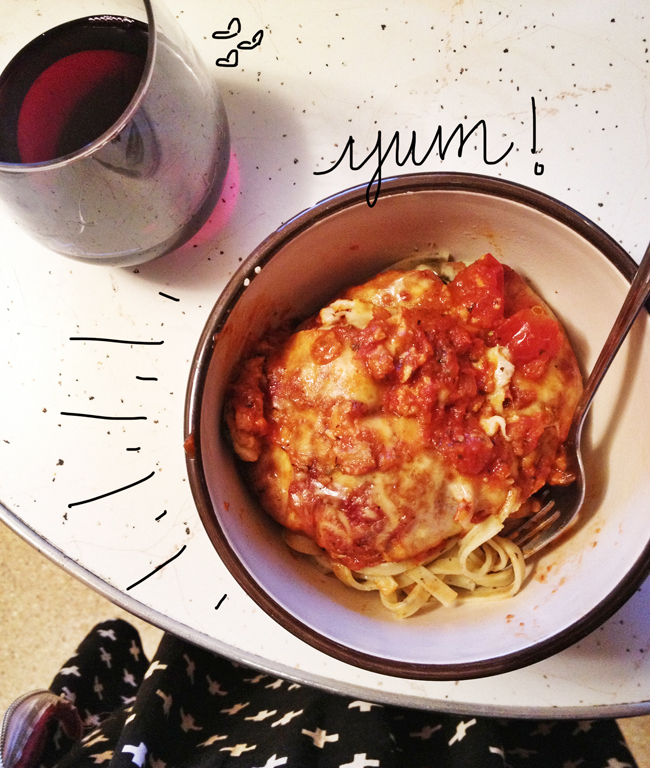 For me Italian just screams comfort food, and who doesn't like a big ol' bowl of comfort? It's definitely a favorite of mine! Eggplant parmesan is one of those dishes that I don't make often, but when I do, I wonder why I don't make it once a week. It's pretty easy and so yummy! I recommend serving it on top of noodles (see picture below), but would be equally awesome with a side of garlic mashed potatoes and a veggie. 1. Heat oven to 400 degrees. Slice eggplant into approximately 1/2 inch slices. Beat egg in small bowl. In a separate bowl, mix bread crumbs with salt, pepper, oregano and thyme. 2. Oil cookie sheet with a thin layer of olive oil. Dip each eggplant slice into the beaten eggs, then fully cover both sides with bread crumb mixture. Place on cookie sheet and cook for about 7-10 minutes on each side. Remove from oven. 3. Cover the bottom of a round casserole dish (dutch oven) with a small amount of tomato sauce. 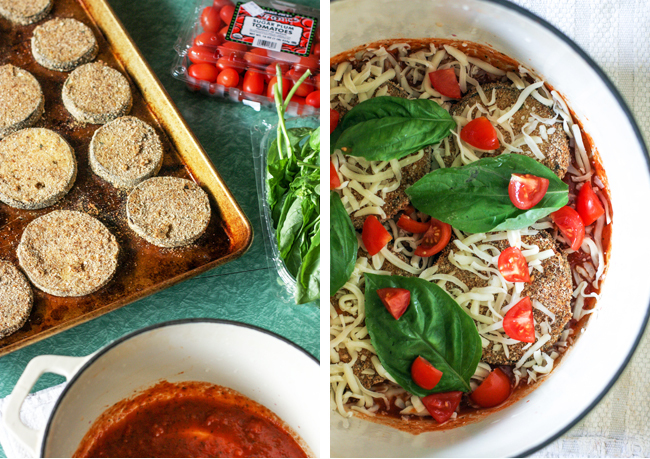 Place eggplant slices on top, cover lightly with mozzarella, tomatoes, basil and more sauce. Repeat to make about three or four layers. 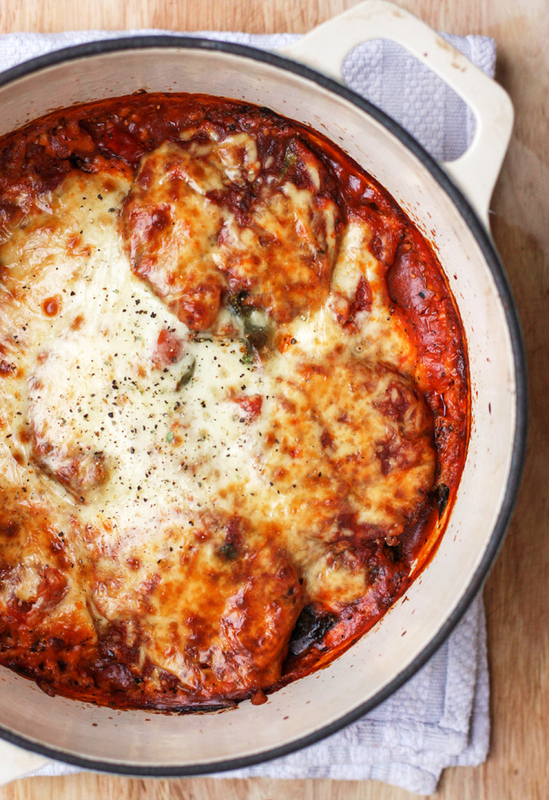 Top with a heavy layer of mozzarella. 4. 4. 4. Cover and cook for about 30 minutes at 400 degrees. Uncover and cook another 20-30 minutes, or until sauce is bubbling and cheese is golden. 5. Serve on top of noodles, garnish with chopped basil. I ate mine on top of Trader Joe's garlic basil noodles with a glass of wine. Yuuum! OH MY GOD. YUM. This looks so so good! Pinning this to my recipe board! oh my this looks and sounds so delicious!